Sony has unveiled the world’s first ’16K’ TV screen that spans two floors, and it’s being installed at a research center near Tokyo for Japanese cosmetics company Shiseido. Measuring 63′ (w) by 17′ (h), it boasts 64 times more pixels than a regular 1080p HDTV display. “We’re moving slowly towards 8K TVs at the end of the decade and who knows how long it will take to get beyond that, so 16K is likely to be limited to the corporate world for the time being. 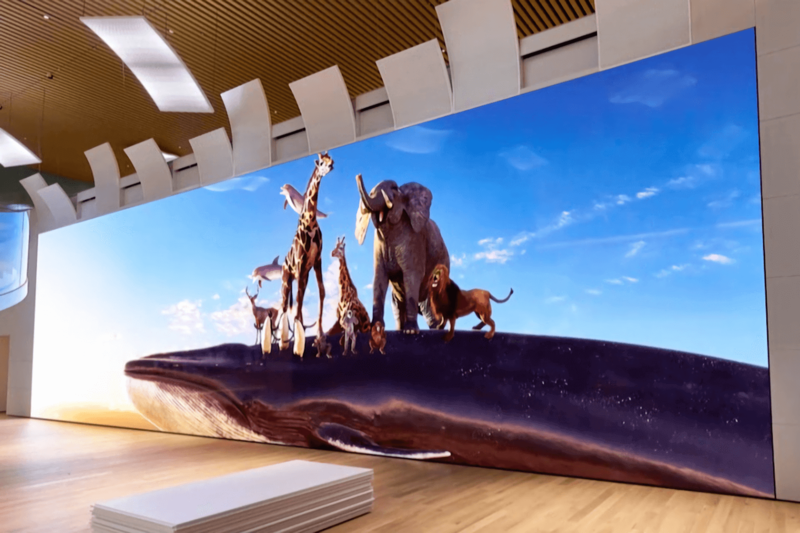 But there’s no doubt about it, these displays are incredibly impressive in person – even 8K on a big display is almost mezmerising,” said David Mercer, principal analyst at consultancy Strategy Analytics. Read more for a video explaining why anything beyond 4K may be useless. “The 63-foot display is built using MicroLED technology carrying Sony’s Crystal LED marketing speak. One of the ideal goals of an ultra high resolution display is to make the image look as life-like as possible. On a large semi-truck sized display, pixel density still needs to be in excess of 50ppi to match that of most consumer grade 1080p TVs. For a viewing distance of more than six feet this is what it takes for most people to be unable to spot the individual pixels,” reports Tech Spot.